Miniature Schnauzers & Friends Rescue is an all-volunteer 501(c)(3) non-profit rescue organization (EIN 20-4545104). Our organization relies upon private donations to help fund our rescue operation. Monetary donations in any amount are always sincerely appreciated. All donations are tax deductible as allowable by law. Because we are an all volunteer organization, 100% of your donation directly benefits our animals. See our special needs dogs to see where your donations go! Yes, we too have wishes.... and you can help make them come true! What's easier than making online donation! 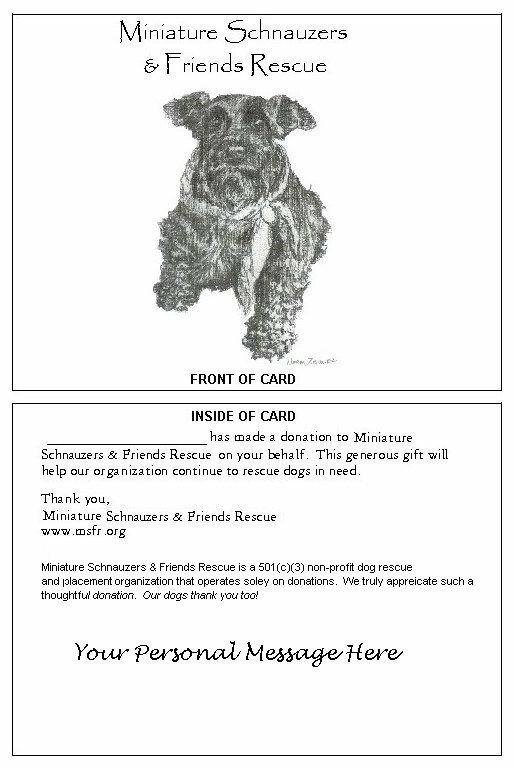 Just click on the button below to make a donation to Miniature Schnauzers and Friends Rescue via credit card! Its fast, easy and secure! Give a Donation as a Gift! Ever wonder what to get that special animal lover for their Birthday or other special occassions? How about making a donation in their name to Miniature Schnauzers and Friends Rescue! We'll send a card to the recipient with your personalized greeting notifying them that you made on a donation their behalf. Perfect gift for animal lovers! Minimum donation of $25 required for sending recipient a card. See Sample Card. Please click here for our gift donation form. Registering your Ralphs Club card an easy way for you to help Miniature Schnauzers & Friends dogs and it won't cost you a cent but it will certainly help us out tremendously! Ralphs' community contribution program allows Ralphs Club Card holders to register their card information with a nonprofit organization that they wish to support. After registering your card with us, each time you use your Ralphs Club card, Ralphs will donate up to 5% of your monthly shopping expenditures to Miniature Schnauzers & Friends Rescue. Just click on the button below to register. It cost you nothing but helps us tremendously! Registering with us at smile.amazon.com an easy way for you to help Miniature Schnauzers & Friends dogs and it won't cost you a cent but we earn $$ everytime you shop via smile.amazon.com After registering with us at smile.amazon.com, be sure whenever you shop at amazon.com you use the smile.amazon.com URL. Amazon donates 0.5% of the price of your eligible AmazonSmile purchases to the charitable organization of your choice. AmazonSmile is the same Amazon you know. Same products, same prices, same service!! It cost you nothing but we earn $$ everytime you shop! Purchase some of our Logo Merchanise! We have a variety of items available, t-shirts, sweatshirts, mugs, magnets, teddy bears, mousepads, aprons, postcards, note cards. Visit our cafepress website at www/cafepress.com/msfr to see the fine selection of Merchandise! Donate Your Jury Duty Pay! Many employers pay their employees jury duty while at the same time the county pays them $5 a day. Want a great feeling about that extra money? How about donating it towards some needing animals at Miniature Schnauzers and Friends Rescue! Please click here for our donation form or to make an quick online donation click here. Many companies have matching programs where they match employees contributions to nonprofit organizations. So please be sure and check to if you company has a program that matches.. it could double your donation to Miniature Schnauzers and Friends Rescue! Please click here for a list of companies that have matching programs! Besides monetary donations there are other basic items that we always need. If you can spare any of the items below, please email us at info@msfr.org or stop by on our pet adoption days. Thank you for any and all considerations... our doggies thank you too! !